than regular potato chips, YAY!! I received a bag of these snacks in my January Love with Food Box. As with most salty snacks like these, I like to drink iced tea! And the iced tea that I have in my fridge is this Cherry Limeade Tea from Southern Boy Teas! The tea is sweet, a little bit tart, and fruity while the snacks are crunchy and salty … and it made for a very enjoyable snack time! These are interesting. They look like straws. They taste like corn chips, but without that dense texture of a corn chip. These have a puffier, crunchy texture that reminds me of my favorite round onion flavored snack. You know the snacks I’m talking about, right? And that’s really cool, because, I think I might like the texture of those snacks as much as I like the flavor of them … maybe I like the texture just a little more than the flavor! And I’m enjoying these. Not just the crunchy, puffy texture, but also the sweet multi-grain taste. There is a nice level of saltiness, and I love that they’re only 100 calories for this bag. These are the kind of snacks that I can really enjoy because they’re not only tasty but they are guilt-free too. I like these. I’ll be on the look out the next time I’m shopping at Whole Foods or Chuck’s Produce. I’d definitely pick up a bag if I found them in the store. I’d be interested in trying their other flavors too, especially the sweet onion and the sweet potato flavors! Using a handful of natural ingredients, 34 Degrees carefully bakes their wafer-thin crackers until they are subtly toasty and overtly tasty. These flavorful crisps pair well with mild to sharp cheeses, blue cheese, spicy spreads, and orange honey butter. They are great for parties and holiday celebrations! 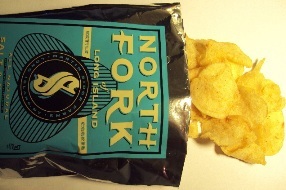 I received a sample pouch of these crisps in my December Love with Food box. I don’t often drink a jasmine tea with the foods that I review, because I find that the jasmine often interferes with the flavor of the foods and I don’t get to explore the foods properly. But that wasn’t the case with these crisps! I thought that this Organic Jasmine Tea from Kally Tea was a perfect complement to these crackers – the savory of the crisps contrasted nicely with the sweet, exotic notes of the jasmine. A really nice way to enjoy these crisps! I didn’t pair these with cheese or any type of dip. Instead, I ate them right out of the package with a cup of jasmine tea, and I found it to be a delightful tea time, indeed! I love the texture of these! They’re so light and crisp. Really tasty. There’s not a lot to them, they’re SUPER thin and crispy and really … that’s it. Just a crispy bit of a cracker. 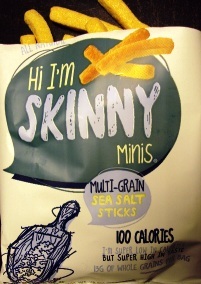 Not overly salty, no extraneous flavor additions … these are kind of like an extra super thin saltine cracker with a little less salt. But I think that’s what I dig about them. 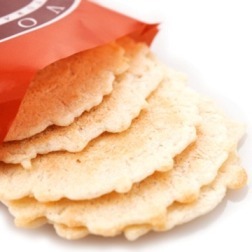 They are just simple little crackers with a really enjoyable, crispy, crackly texture. I am definitely going to be buying these again. I found them in my local grocery store, and they have a variety of flavors, so I think I’m going to do a little exploration of these crisps, and next time, I’ll try them out with cheese and dips too. I received a tray of these pistachios in my November Graze Box. I recommend a fruity iced tea to drink while snacking on these flavorful nuts. I drank some of this Acai Squeeze from Argo Tea – a ready to drink tea? Yes! The tart, fruity notes offered a really interesting contrast to the peppery kick of the pistachios. Of the four snacks that I received in this month’s Graze box, this was the snack I was least excited about. Don’t get me wrong, I love pistachios! But, I have tried a salt and pepper version of pistachios before and I wasn’t all that excited about it. I mean … it was alright, but, it wasn’t something that I’d ever buy again, and because we purchased a rather large bag, some of those pistachios ended up wasted because they weren’t as good as I imagined them to be. 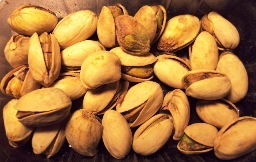 So … I had my misgivings when I opened the tray of these pistachios. But these are really tasty, and much better than I remember that previous version of salt and pepper pistachios. First of all, these aren’t overly salted. There’s a small amount of salt on these, just enough to bring out the natural flavors of the nut and to enhance the pepper. Second, the pepper isn’t overdone either. It’s the perfect amount of pepper. It is enough so that there is a distinct peppery kick but not so much that I feel like I need to take a sip of tea in between each nut. Neither seasoning is so overdone that the pistachio is overwhelmed. The nut tastes toasty and has a pleasant crunch. The pepper adds a pleasing contrast to the sweetness of the pistachio. Not too salty, not too spicy … just the right balance of flavor with this snack. I like it a lot more than I thought I would. Click on pic to go there. The Salty Road brings you delicious handcrafted saltwater taffy made with local apple cider jelly from Brooklyn, New York. A chewy treat with notes of apple, cinnamon and allspice with a signature sea salt crunch. I got a box of these taffies in my October Knoshbox. Mmm! These taffies are so good, and the only thing that makes them better is some tea to sip while eating them. I brewed myself a pot of this Keemun Black Tea from Teasenz to enjoy with these chewy taffies, and I like the way the smoky elements contrasted with the sweet confection. A very interesting pairing! Seriously yum. Every time I get my hands on a taffy from the Salty Road … I become more enamored with this company. These are the BEST. Taffies. Ever. I love that little crunch of sea salt that I get in every little bite. It’s not overly salty … but there’s just enough crunch to give a different texture to the very chewy taffy … and just enough salt to cut into the sweetness of the confection. I taste the apple. I taste the caramel. I taste the allspice and cinnamon. I taste the salt. And this is total yummy deliciousness. It tastes like apple pie with a drizzle of salted caramel! So very, very good. My final thoughts this time are really simple: MORE PLEASE! Great Bean is on a mission to deliver the highest possible state of wellbeing through raw, organic chocolate. After working as a professional chocolatier in Austin, Texas, founder Nora Hamerman became well known throughout town for her creations. In 2012, she set out to create an innovative, healthy, and environmentally-conscious chocolate company. Great Bean chocolate was born to nourish, indulge, and regenerate. I received this bar of chocolate in my February Knoshbox. I like eating chocolate bars with a cup of pure black tea, preferably one with a natural chocolate-y tone to it. However, because of the lovely notes of cinnamon in this tea, I thought that I’d select a tea with a slightly spicy intonation, like this Grand Yunnan Imperial from Le Palais de Thés. It was an excellent pairing, I like the way the warmth of the tea brought out some of the deeper flavors of the chocolate bar, and the sweet fruit notes of the tea accentuated the flavor of the fig in the confection. It’s chocolate! OK, I’ve got a confession … I tend to ‘hoard’ my gourmet chocolate bars that I receive in these boxes for times when I really need … good chocolate. That’s why … I haven’t reviewed this chocolate bar until now. This is really yummy. I am not always as excited about raw chocolate as I am for roasted chocolate, because the roasting of the cacao bean brings out some really lovely flavors in the chocolate. But the combination of the fig, cinnamon and herbs really works to the raw chocolate’s advantage, I think. There is a really sharp snap to the dark chocolate. The cinnamon melds beautifully with the chocolate to give it a warm flavor … something that I think would be “lacking” in the raw chocolate otherwise. The cinnamon sort of gives this candy bar that sort of warmth that it needs. In addition to the herbs I taste sea salt and of course – the fig! I love the fig in this bar! It adds a neat texture that is chewy and the seeds of the fig crackle in my mouth! And it’s sweet and really quite yummy. The bar is not overly sweet, it is a good balance of bitter and sweet flavors. There is a really nice depth of flavor to this bar … it’s a delicious, multi-dimensional candy bar. It is at once bitter, sweet, salty, and just … INTERESTING to eat! The Salty Road brings you delicious handcrafted saltwater taffy from Brooklyn, New York. Bergamot is the classic Earl Grey tea flavor. A chewy, floral, citrus treat with a signature sea salt crunch. I received a box of these taffies in my August Knoshbox! I considered the obvious choice – an Earl Grey tea – but, then I decided that since there is already plenty of bergamot flavor in these yummy confections, I didn’t need to amplify that. Instead, I decided to complement it with a pure black tea, so I went with this Nuwara Eliya BOP Ceylon Tea from Upton Tea Imports. I love how the natural fruit-y notes of the tea meld so beautifully with the chewy candy. A really delicious tea time! Being a tea enthusiast (actually, I think I’m probably more of an obsessed fanatic when it comes to tea! ), and as Earl Grey Tea is one of my very favorite teas out there … I have been wanting to try these Bergamot flavored salt water taffies from Salty Road for a long time … ever since I first tried the Salty Peanut Taffy! So I was very excited when there was a whole box of these taffies in my Knoshbox for August! These are SO yum! I contemplated reviewing them on the SororiTea Sisters tea review blog, but since these are flavored only with the bergamot essence and not with the tea … I decided against that. But these are such a delicious way to experience bergamot! The taffies are very chewy, and I also notice a delicate crunch as I chew on them … the crunch is from the sea salt that is in each and every taffy! I love the salt in these … it brings the bergamot flavors out in a very unique way. The bergamot is tart and tangy, but not to the point of puckering. A hint of a floral note that adds to the interest of these unusual but delicious candies. There is a “juiciness” to the flavor too, the candies are bursting with citrus-y flavor. I absolutely LOVE these bergamot taffies. I might even like them better than the salty peanut flavored taffies! My only complaint? The box of taffies becomes empty way too fast! ha! I really MUST order more of these … as well as some of the other flavors that Salty Road offers!